The pilot reported that the battery was too low to start the engine, so he asked fixed-base operator personnel if they could assist with a jumper pack. They told him that they did not have anyone on duty authorized to assist and that he would have to wait a couple of days. He decided to start the engine by hand propping. Before he began hand propping, he set the parking brake. Following the engine start, the airplane began to move forward. 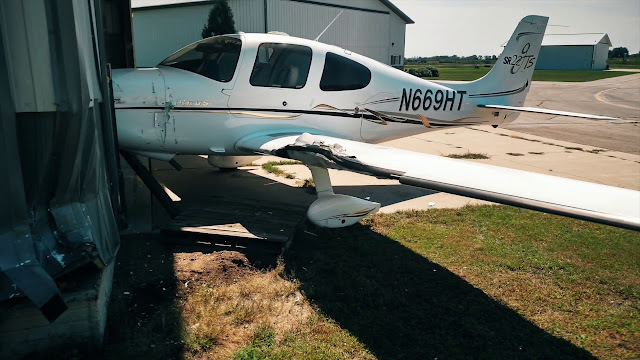 The pilot attempted to re-enter the airplane to apply the brakes, but the airplane struck a hangar. The Federal Aviation Administration inspector who examined the airplane after the accident reported that the parking brake functioned normally. He added that the pilot stated that he was sure he set the brakes but that he may not have gotten enough pressure to hold the airplane. An engine should not be hand propped unless two people, both familiar with the airplane and hand propping techniques, are available to perform the procedure. The person pulling the propeller blades through directs all activity and is in charge of the procedure. The other person, thoroughly familiar with the controls, must be seated in the airplane with the brakes set. As an additional precaution, chocks may be placed in front of the main wheels. If this is not feasible, the airplane's tail may be securely tied. Never allow a person unfamiliar with the controls to occupy the pilot's seat when hand propping. The procedure should never be attempted alone. The pilot's improper hand propping procedure, which resulted in a runaway airplane and subsequent impact with a hangar.